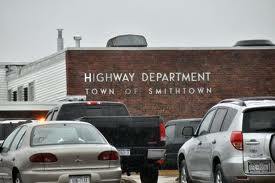 The Smithtown Highway Department is responsible for the maintenance and improvement of the town's public road infrastructure. The infrastructure includes more than 470 miles of roads, drainage systems, recharge basins, driveway aprons, and curbs. The Highway Department also maintains a fleet of approximately 200 vehicles, including cars, trucks, and construction equipment. The town's maintenance responsibilities include snow and ice control, road patching, street sweeping, and the removal of brush and leaf bags. The Town of Smithtown Highway Department does NOT pick up stumps from trees outside of the town’s right of way. The Smithtown Highway Department annually undertakes approximately $8,000,000 in road maintenance and improvement projects on our town roads. These projects include road reconstruction, resurfacing, and installation of drainage facilities. Who do I contact for pothole repair? Why doesn't the town offer a set schedule for leaf and branch collection? Does the town supply leaf bags to the residents?